"Peppino Profeta has waited long enough!" 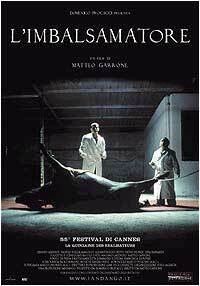 the title character defiantly announces late in Matteo Garrone’s dark character study, The Embalmer. By this time it is clear that if Peppino Profeta has decided he’s waited too long for something, Peppino Profeta is smart, unscrupulous and dangerous enough to get what he wants. As played by Ernesto Mahieux, Peppino is the embodiment of competence, a gifted taxidermist capable of preserving something as tiny as a shrew or as massive as a bull. Plausible, intelligent, and often endearing, he’s as confident unveiling a civic project for a public square as he is slicing open cadavers to retrieve contraband for the Mafia. He’s also so small as to almost qualify as a dwarf, but so apparently unselfconscious about it that the people around him can almost forget about his size. His one real weakness is a fondness for beautiful young men, specifically Valerio, a magnificent, rather passive specimen who Peppino takes on as an apprentice. Unfortunately, Valerio’s girlfriend, Deborah, is neither as supine nor as willfully obtuse as Valerio. In depicting the struggle between Peppino and Deborah, Matteo Garrone’s The Embalmer takes the viewer on a weird journey of discovery about all three characters, their limits, their strengths, and exactly how far each is willing to go. There are moments when Peppino’s charming, slightly broken toothed smile could be a sign of either confidence or despair, and there are hints that Deborah could be something a bit more dangerous than merely a spoiled girl from a wealthy family. And is Valerio truly passive, or is he simply a so far directionless, physically powerful young man who has not yet been spurred into action? This kind of story requires strong performances, and all three of the leads, Mahieux, as Peppino, Valerio Foglia Manzillo as Valerio, and Elisabetta Rochetti as Deborah, succeed in drawing the viewer so deeply into each character that it’s hard to take sides. Mahieux’s performance is the most memorable, but Manzillo does a very good job of depicting a man who may be much shrewder than he is willing to admit. Bernardo Terrracciano is also intriguing as the Mafia chieftain who seems both professionally and personally concerned about the welfare of his little embalmer. It’s a tribute to Mahieux’s performance that many viewers share that concern, in spite of the crimes Peppino commits in the name of love. The Embalmer is not a thriller in the sense that it makes viewers jump or their hearts race, but it is a twisted and fascinating tale, with a climax that’s as logical as it is unexpected. It’s a story about friendship, personal resources, the possibilities open to the young and the increasingly desperate need of a talented middle-aged man who believes that his time is running out. Above all, it’s a movie that respects the intelligence of its viewers. The final scene is definitely the end of one story but — as in real life — it is also plainly the beginning of another. In an American movie, this would mean a sequel. In this film, it means food for thought, and a willingness to allow the audience to draw their own conclusions.